Although China has tactically reduced tensions in the South China Sea (SCS) by removing its oil rig HD981, paramilitary and naval forces from Vietnam’s exclusive economic zone (EEZ), the region was still high on the agenda at the 21st ASEAN Regional Forum (ARF) on August 10 in Naypyidaw, Myanmar. 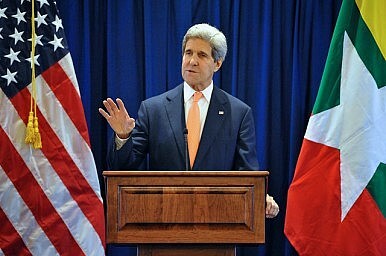 U.S. Secretary of State John Kerry proposed a “freeze” on actions in the SCS. Chinese Foreign Minister Wang Yi for the first time brought up a “dual-track” approach to solving SCS problems, and called for a ”21st century security concept.” The two initiatives seem to belong to two different worlds. They also introduced initiatives aimed at countering each other. The nature of the freeze is to voluntarily and jointly halt the sorts of activities that would complicate or escalate disputes, asking parties to: (i) refrain from establishing new outposts on unoccupied features or seizing features that another claimant occupied; (ii) clarify what maintenance operations are acceptable and which expand the nature, size or capabilities of the land features. Kerry’s proposal was probably based on the fact that China has dredged coral and sand to build wharfs, artificial islands, airstrips, garrisons, and most recently lighthouses in the region. The U.S.-China engagement on the topic of the SCS highlighted several important aspects. First, multilateral forums including the ARF, East Asia Summit (EAS), ASEAN Defense Ministers’ Meeting Plus (ADMM+) and the Expanded ASEAN Maritime Forum (EAMF) are very important venues to discuss these issues, and that must continue to be the case. Those institutions “may be slow to evolve and dependent on the comfort levels of Southeast Asian countries traditionally cautious about offending China or anyone else. But they are making progress as pillars of a multi-polar regional order, in which norms of non-coercion, respect for law and a rules-based approach get a hearing among nations with diverse political systems,” according to Rory Medcalf from the Lowy Institute. ASEAN will play a more crucial role, particularly when its community is established next year. Second, other major players including India, Japan or Australia will have a more in-depth engagement in the SCS. Each country via different strategies will maximize its interests there. Oil and gas cooperation in ASEAN claimants’ EEZs is in line with international law like UNCLOS. Naval cooperation has blossomed to safeguard freedom of navigation, etc. Third, Beijing will have to change its perspective. A new situation characterized by the U.S. strategic shift to Asia requires proactive cooperation with ASEAN to solve problems, not increase assertiveness. Concerning this connection, Wang said that China is ready to strengthen dialogue and cooperation with ASEAN, to deepen practical cooperation within the framework of the Declaration on the Conduct of Parties (DOC) and push for the early conclusion of the Code of Conduct (COC) for the South China Sea. The progress on the COC discussion in October will be the test of that commitment. Thuc D. Pham is a researcher on the SCS at the Diplomatic Academy of Vietnam. The opinions expressed in the article are those of the author and don’t represent the views of institutions to which the author is attached. All parties showed interest in conciliation, even if a COC was simply a prop to further dialogue.